Here is an older pattern of mine that is part of a series I designed in 2012 called the "Little Bigfoots"
I recently decided to redesign them and make each pattern a little more user friendly but at the same time retain their original characteristics. And also give each one their own video tutorial, which is so exciting! I am very happy with the new design and I hope you all will be too! and body are now worked in one piece which means less sewing! Read me ~> Work in continuous rounds, do not join. I used Red Heart Super Saver and also Red Heart Comfort yarn with a 4.50 mm hook. Have any questions or if you come across a mistake in the pattern please leave a message in the comment section below. * For this project I am using a 4.5mm hook. I crochet fairly tight stitches so if you crochet stitches more on the loose side then try a smaller hook. A 3.75mm will give you tighter stitches. Also, there are different options for the eyes but if you use safety eyes be sure to put those in before closing up the head. The yellow bunny has safety eyes and those are in between the 8th and 9th row with about 7st between them. 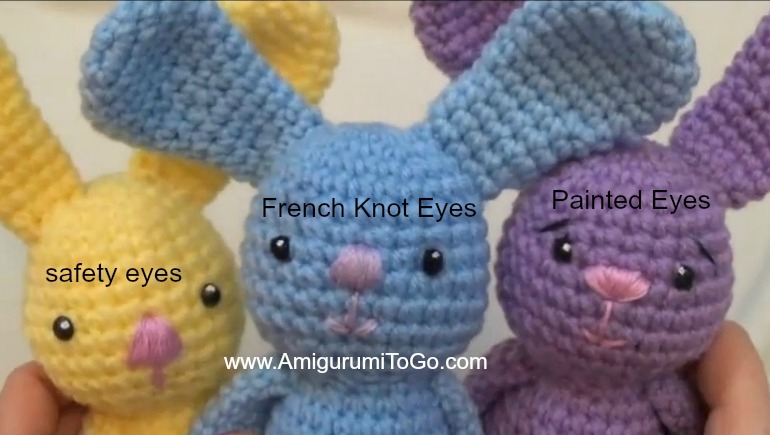 The video tutorial includes how to make French Knots and also how to paint on the eyes. I used a pom pom for this bunny which I show you how to do in the video tutorial. It's quick and easy and you do not need any tools other than your fingers and yarn. Wrap about 75 or 80 times around 3 fingers. Tie off the middle. Cut through the loops. Trim and then sew to the bunny. 3) sew on the ears. Pin them in place before sewing them in helps. But again, view the video for tips on sewing this part. Also you can add in a pipe cleaner to make the ears poseable if desired. Simply bend over a pipe cleaner and push the bend inside the ear. Add in a few stitches to ensure the pipe stays put. 5) you can add in toes or leave the foot as is. Wrap yarn around the front of the foot in 3 different sections. Pull tight and bring yarn tails out through the leg, knot them off and hide inside the leg. Go over the yarn lines with a brown or black embroidery thread to give the toes some definition. View video at 46:43 for how to do this. What pretty and I like the colors. Are you thinking of revising the other Bigfoot patterns as well? I absolutely LOVE all of your patterns. I've made several of them. I cannot thank you enough for so generously sharing your patterns and expertise. I am relatively new to amigurumi (the last year or so) and have made several of your critters. I especially have appreciated the little tips you offer here and there. 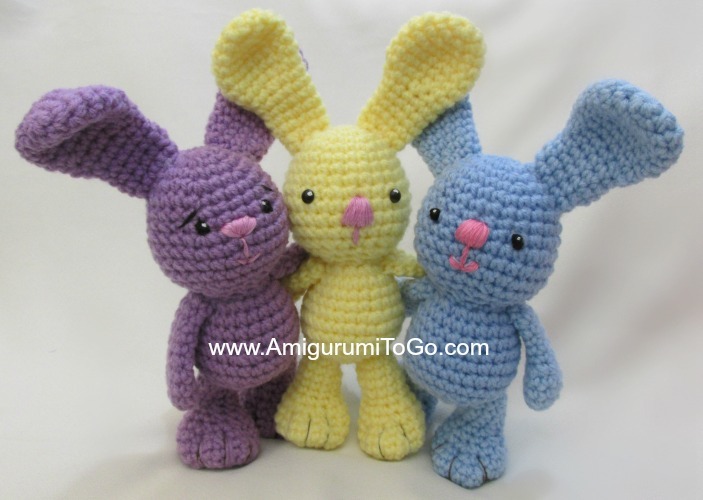 Have you considered writing a book...Everything you Need to Know About Amigurumi....I would sure buy it! A book is in my future, just not sure when I will start! Maybe late this year or early next year I will begin that adventure. It's a very exciting and I'm just holding back until I feel sure I'm ready for that step. But definitely going to happen! You've referred to punch embroidery thread in your patterns. What exactly is it and how does it differ from DMC embroidery floss? Do you have a link for it? Hi Sharon. I have only just started to crochet and I have recently watched some of your videos on you tube. They are excellent and really easy to follow so thank you for that :-) I have now started to follow your bolg and bought some yarn today so I can have a go at the big foot bunny. Can't wait to get started now! any video for us to follow cos i find it difficult to follow the step ..thank you! By any chance do you have a dog or horse pattern? I love your patterns thank you so much! Your work is amazing I couldn't figure out how to post the bunny I made. Came out great. Your patterns are written perfectly. Definitely would buy your patten books if you make them. What other patterns do you make? Again thank you for your wonderful free patterns that come out so cute and cuddly! I too would love to see a horse pattern too!....maybe the giraffe with a shorter neck??? I have some granddaughters absolutely in love with horses. I've looked online and just haven't found what I'm looking for. I too would buy your pattern books. I appreciate so much what you make available for free. You need to put something on your blog where someone can buy you a coffee or give you a small gift just because they want to. I've seen that done on other blogs. Thank you so much Linda, I appreciate the awesome message. I don't have a horse pattern yet but I do have a horse board with links to other patterns on pinterest. I just added a pinterest link to this blog, scroll up to the top of this page and on the right hand side there you'll see my site buttons.. pinterest is just under my facebook badge. Hello Sharon, from now on, I'm a big fan of your bigfoot-ami's! 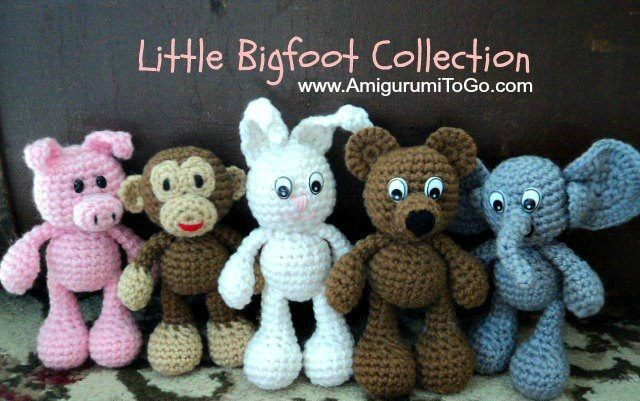 I had a problem with choosing a new crochet project and to give myself some time to think about it, I begun with this cute pattern I had on my pinterestboard (as some of your other patterns) And now all the other patterns have to wait, because I want to crochet your big foot-ami's first :-) Thank you very much! Hello Sharon, my bunny and turtle are finished, I really love those two little friends! Thank you very much again for the patterns, I'm sure I will make more bigfoot ami's! I like the pattern and the pint friendly feature is nice except your font is small ; an I could copy so I could enlarge the font. the font is set at normal so don't know why it would be too small. In blogger there's small, normal and large and large is way too big. I have so far made the giraffe, and I am now doing the bunny and the lion. I am having problems getting them to stand. Is it because I don't put enough stuffing in the legs, or do I need to put some pipe cleaners or metal into them? I don't like to do that, as they are meant to be children's toys, so what can I do? Thank you for replying. Weights can be put in the feet to make them stand better on their own but I wouldn't recommend that if they are for children. Mine get pinned down onto a surface I have especially made for photo purposes only.. they really are not meant to stand. 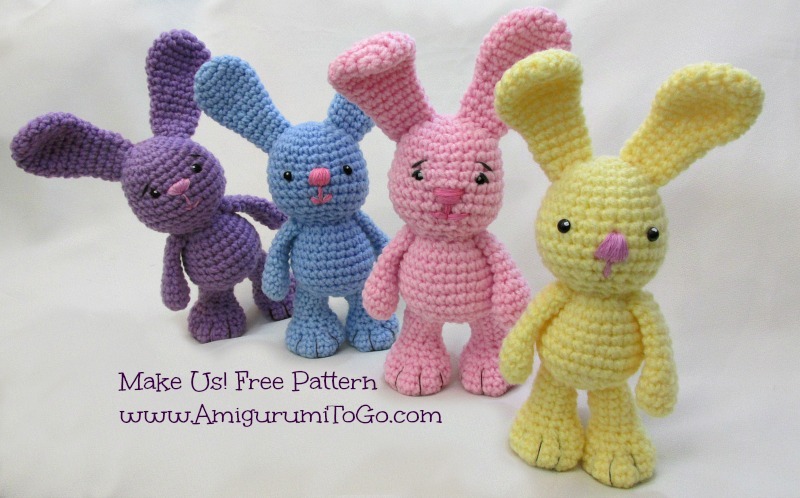 The pattern would work better with acrylic yarn but I can't say for certain how pearl cotton would work for you, I've never tried it but I do know your bunny will come out quite a bit smaller. And all I can suggest is using the right hook size for the yarn weight you are using. I don't know what hook size that yarn calls for.. maybe it tells you on the package? If not ask your local yarn store or google it. sorry hit publish to soon. I hope that information helps! When are you going to revise the lion an bear an hippo little bigfoot ones ? Does a 5.00mm hook and 2.75 work to make the little big foot bunny. The yarn that I bought is acrylic I also have polyester which one works more? Thank you so much for sharing these! I was very surprised at how little yarn was needed to make one (I made the bear and elephant - will post a pic on FB soon, these are the first ones I've ever made). I am offically addicted! :D. Your patterns and videos are easy to follow along with. Finally something other than hats, mittens, blankets and scarves. (I would definately buy your book when it comes out) I get scrap yarn given to me all the time. I now have something to do with it. I will be making these cute animals for the local childrens hospital and some for new mommies in the maternaty ward :) I am going to print these out and put them in page protectors so I can use dry-erase markers to mark off my rows. Again thank you so much! Keep sharing and keep up the good work. God Bless! Happy Crocheting and many Blessings to you! I really want to make them all! They are so adorable! 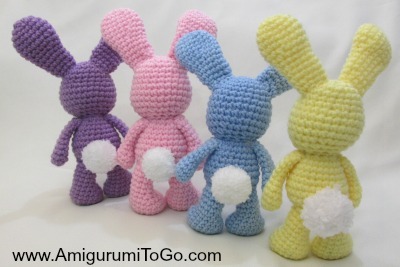 Thank you so much for the free pattern :) can I enlarge the bunny by using heavier weight yarn or the thicker yarn? I am a crochet newbie and I look forward to receiving your posts in my email. Your animals are adorable. Thank you so much! Thank you for these brilliant patterns. I have just made the teddy bear, and love it. Looking forward to making more. I have a lot of nephews and nieces who are going to love these. Hi, I love this little bunny and have made one with a 3.75 needled and that seemed to work well. My sister is due to have a little girl in just under 2 months and I would love to give the little one a big bunny she can hopefully grow up with! If i wanted to make this plush much larger, how would increment the stitches? Say a size 8/10mm? Is this even possible. Thanks again for sharing these lovely patterns. Your YouTube videos are fantastic and they have really helped me, as after a lot of practice, making blankets and pillows ect. the little big foot bunny was my first real project and thanks to your video he came out perfect! I have another bunny pattern that's 15 inches tall right here Dress Me Bunny and look for the list of clothing patterns at the top of that post. Hi. Can you tell me the size of the bunny from ears to feet? I see the Wee Bits are 5.5 inches and the Dress Me Bunny is about 15 inches. Not sure which one i want to make so please tell me the measurements on this. Thanks! yes, you just have to install them before you get too far into the pattern that your hands won't fit in the head. Thank you so much for sharing your talent with us. I appreciate both the written patterns and the videos. Thank you for sharing your talent. I'm looking forward to making these little cuties. Hey Sharon. First I just wanted to say thank you so much for your patterns. They are really wonderful, super cute, and great for a beginner to learn on. I'm having trouble with the pom pom tail on the bunny though. I gave the bunny to my baby daughter once I'd finished it, and she pulled on part of the tail and little pieces of white yarn started to come out. Have I done something wrong when I made it or is this just what happens if the tail is pulled on. I thought I had did a warning in the video about that but maybe it was in the pom pom video that I have as a stand along video.. I can't remember now but yes, they will come apart when pulled on. That's for all pom poms, even the ones you buy if they are made with yarn. I add glue now to mine. 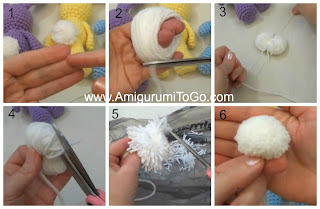 Google "How to Make a Yarn Pom-Pom without it Falling Apart" and look for the video by "Repeat Crafter Me" she shows how to do it. Hope that helps! I was wondering how one would go about getting copies of the original 2012 patterns. thanks for asking. I just added a new label called "LBF 2012" so go to the label cloud on the right hand side of this page and click on that label. All the patterns from that series will come up for you. I made one of these a little over a year ago for my older cousin and wanted to make one that's the same pattern but bigger, so I finally figured out how to double the pattern for a double sized little bigfoot bunny. I love these little animals i am making them all and giving one to each of my grandbabies for easter in there baskets. thank you for the patterns. i will try and donate when i get some extra money at tax time. I love your work! And your videos are super easy to follow! Can you make Noah's Ark??? hi happy to hear your doing better! i started making a little big foot bunny and it seems real small. i was wondering how big yours are? thank u bunches. I didn't use any for this one. I show how to add yarn in the video to make the eyes. If you wanted to use safety eyes, I would use maybe an 8mm or 9mm.